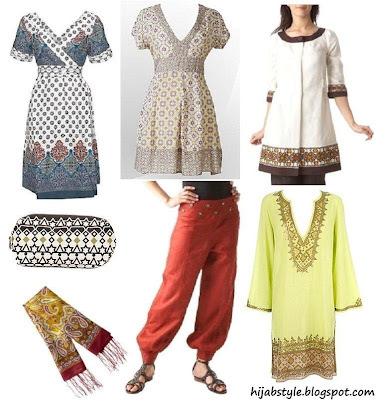 Blue print dress £29.99, House of Fraser; pink print dress £38.95, Uttam Direct; jacket £59, Promod; Fairtrade purse £4, Accessorize; paisley scarf £12, Miss Selfridge; harem trousers £29, Promod; jewel kaftan £65, Monsoon. I love to wear this look lounging around my hose or down at the beach. House. And I love harem pants... lOL. This blog is our harem Hayah: no men allowed LOL. i have a problem, tho, i am a big girl and it's hard to find nice clothing that actually fits me... any ideas? I love all the shirts and no I would mostly likely never wear the pants (they remind me of MC hammer pants). I agree with not liking the title of the pants either. I know I'm going off on a tangent but it makes me think of really good documentary called Hollywood Harems which looks at how Hollywood has depicted Arab/Muslim/Eastern women in a negative and over sexual light since the industries inception. Like I said random thought. I like the Moroccan prints a lot, not too sure about the pants though. Alix, it certainly is our online harem lol. Melda, there are lots of shops which stock plus-size ranges now. Check out 'Inspire' at New Look, 'Gorgeous' at Debenhams and the ranges at BHS, I'll post outfits as soon as I can inshallah. Farrahh, for sure you have to come shopping in London, though I'd love to go in the US! Sharshura, MC Hammer rings a bell lol, can't quite remember what he looks like though! Not a random thought at all, it's exactly why I hate the name 'harem pants', because of all the Hollywood connotations! Umm Salihah, you know the only hijabi I ever saw wearing these was actually Morrocan, and she made it work really well! Have I ever told you how inspiring your blog really, truly is? I fell in love with that white jacket thingy. Though its sleeves are just 3/4, I think it would be okay to wear a long-sleeved shirt under it, right? Ammena, lol I'll have to look him up! Anon, oh lucky you! Hope you have a good time inshallah!